Bingo – game rules. 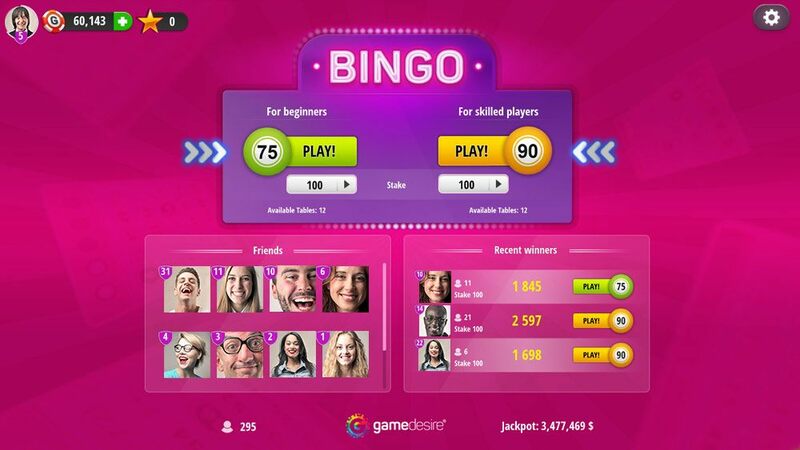 Bingo ABC – see how to play Bingo on GameDesire! Văz ascuțit și reflexe rapide? Încearcă-ți mîna la Bingo! 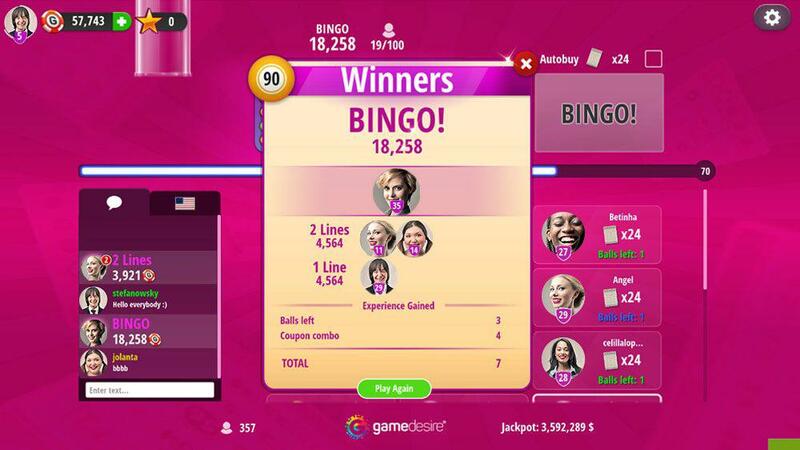 Bingo is a game of keen eyes and reflexes, in which the players fill their coupons with random numbers. Depending on your choice, you may play Bingo 75 and Bingo 90. Bingo 75 - this variant is played with 5x5 coupons, and there are 75 numbered balls used in a draw. First player to get a winning combination lets the others know about this by calling "Bingo!" Bingo 90 - The rules of Bingo 90 are very similar to Bingo 75, except there are 90 balls, and instead of „Bingo” you may call "One line", "Two lines" and „Full house”. Each of the combinations may be called once per game. When you join a particular table, the game mode selector will be replaced by a game details window. It is filled with information about the upcoming game, such as the total prize, number of players and coupon price. 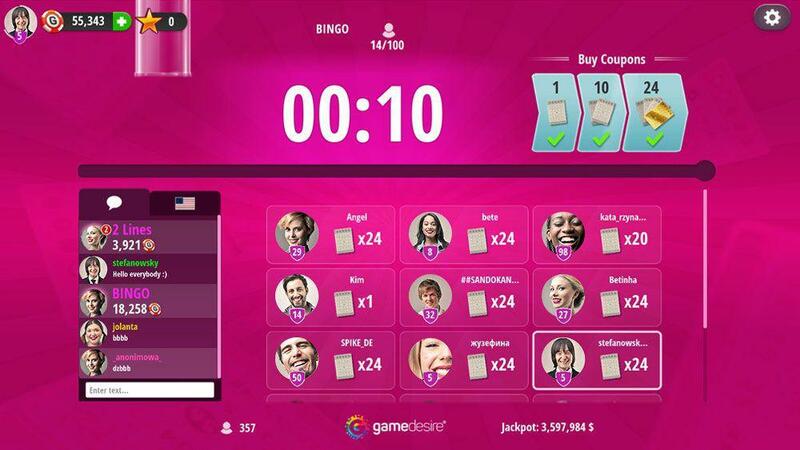 In this window you can see messages from other players and information about a player hitting Bingo. There are also tabs for private conversations with friends. Next to each player's message there is a grey arrow which turns green when covered by the mouse curser. Click the icon to open the context menu, which will allow you to start a private conversation with selected players, see their mini-profiles, add them to the list of friends or ignore them. After the lottery starts, the game window is systematically filled with numbered balls which have been drawn. Below are your coupons, each marked with the amount of balls needed to win. Claim your victory (One line, Two Lines, Full House, Bingo) when the coupon says "Balls left: 0"
On the bottom bar of the screen you can see the current jackpot – an additional special prize available for Bingo winners. If you fill your coupons with no more numbers than specified in jackpot and score bingo, you also win the jackpot. To the bottom of game window you can see a progress bar and number of balls drawn. On the progres bar there are also balloon bonuses, each defined with certain codition. Fullfilling the condition results in extra XP points. 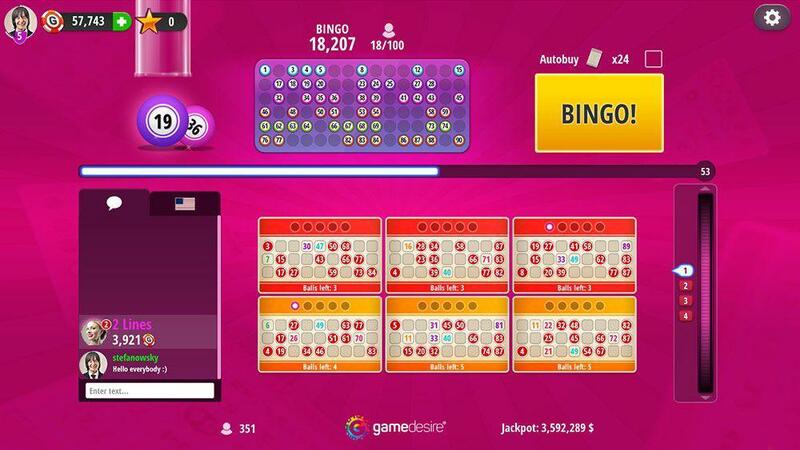 The position of the golden balloon visible in Bingo 75 and Bingo 90 represents how many balls can be drawn before Jackpot becomes unavailable in this game. Red balloons represent bonuses for hitting multiple numbers on the same coupons, while blue ones are for filling one, two or three horizontal lines in a single coupon. Failing to meet the condition before specified number of balls is drawn causes balloons to fly away. If you do not have any balloons on your account, you are unable to get balloon bonuses. In such case only golden balloon is visible on the progress bar. Balloons are automatically deducted from your account each time you join a game.